Can it really be December? The early sunset and lights on the palm trees say it is. The snowbirds are starting to flutter onto the island and tons of holiday activities are piling up on my calendar. I'm looking forward to events like the Hometown Holiday Parade and the Lighted Boat Parade and lots of Christmas music. This week I attended the lighting of the Christmas tree on the harbor--utterly charming if not exactly rivaling the tree at Rockefeller Center in New York City! Miss Gloria and I decided we really don't have room for a Christmas tree on our houseboat's deck--not if we ever want to sit out there. And it's our favorite place in the world to lounge with the cats and watch the world go by. Even the annoying schnauzer next door can't ruin the mood when the boat's rocking gently and the breeze is blowing and I see on my news feed that six inches of snow has been dumped on my hometown in New Jersey, with more on the way. So anyway, I went shopping for a mini Norfolk Island pine treeat the MARC plant store instead. Here's who I found shopping at the same time. What do you suppose he was buying? To celebrate the holiday season, and thank you for buying books and reading them, we'll be giving away a Key West mystery to someone who comments today. MURDER WITH GANACHE will be in bookstores on February 4, but hurry over to enter the contest at Goodreads for 3 signed galleys! Merry Christmas and Happy New Year from Hayley, Evinrude, Miss Gloria and all the Key West gang--including Lucy and Tonka! Right now it's just raining in New Jersey. I'd like to try for Murder With Ganache. I'm a transplant from New Hampshire to Charleston, SC. I love the fact that today I get 80 degree temps as opposed to the year they cancelled school because of snow. Christmas decorating is much easier in SC than NH too, as my hubby noted putting up the outside lights in a t-shirt compared to bundling up and hoping the ladder doesn't slip in ice or snow is a pleasure! I would like to read Topped Chef. We are in the process of moving and will be living in a motel for the next few weeks so I have to get my Christmas decoration fix from the decorations the motel puts up and any other businesses I visit. I do have a string of lights in our motel room to help a little. It will definitely be a different Christmas for us this year! I would love to win one of these books. I would like to win either Death in Four Courses or Topped Chef please. 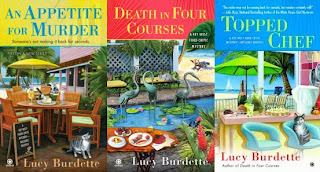 Hi Lucy: Read the first and would love to read Death in Four Courses. thanks, mlarkin(at)reitmr(dot)com. I'd love to have An Appetite For Murder! Thank you! It's raining here now but it will soon turn to snow! I would love to win any of the books as I am a new reader to this grouping. I read all the time 2-3 books at a time, and I am adding this list to my get-to-know authors. Happy Holidays too! I would love to win any of these books...all unknown quantities to me. Key West is such a wonderful place; I've been there twice, so far. Aww nookies, now I am hungry for ganache.... if I can't get the book, can I get a cupcake? I have been really enjoying this series. Didn't realize a new book was coming out in February. Glad to know that. I don't want to be greedy since I won yesterday, but I'd love your new book. I've read all the others and I'll read this one whether I win or not. Love this series!!! Thanks for the photos above...too cool. Hello - I'd love to win Death in Four Courses - looks like a great series of books. I'd love to win any of these books, thanks. glad i found this site via another author. love recipes and holidays and a bit of mystery, i'll have to get going on the series because it looks like one i'd totally enjoy. Merry Christmas! While Key West sounds lovely, at Christmastime I prefer to be in the snow and cold! Would love to win An Appetite for Murder. I would love to win any of these books!!!! That reminds me of Christmas in San Diego.It looks pretty much the same. Christmas in the tropics. Gotta love it. Lucy, you live the life that many people dream of! I love Key West and we visit there often. We live in Fort Myers so we’re not too far away! Would love to be your winner. All the best! Wow..this is a great contest!! have to admit, have not read the books so would love to win one and add to my list of fav authors...hope I'm the lucky one! Thanks!!! Watched Master Chef:The Professionals on TV here in the UK last night so I think Topped Chef would be my first choice to read, thanks. Love the picture--you two are very cute. Topped Chef is my choice. libbydodd@comcast.net Come on, Evinrude, pick me! Would love to win one of your books. If I win I would like An Appetite For Murder my email address is: rbauldree2001@yahoo.com. Thanks for the chance to win. I'll never understand Christmas in Florida, lights on palm trees? Any of the books would be great - no rush, not like I have nothing to read! Any of your books would be great, although I do like to start with the first one if it is a series. We are having a cold spell here in the San Francisco Bay Area, temps inside the office are still at 58 after two hours of heat. Love the Santa hats with a tank top! Brrr. I would be happy to win any of your books. They all sound good. Love the hat with the tank top. A little cold? Thanks for the giveaway. It's raining here in Maryland but not cold enough for snow, thank goodness! I am a huge fan and would love to have one of your books for my collection. Any of the books would be appreciated. Lucky you living where it is warm in winter. Would love to read any of your books. Books, books and more books....can never have enough! We are even whining here in N. California - it was 31 degrees when I left the house this morning :-(. I would love to be in FL right now - but Topped Chef or Death in Four Courses would be a good substitute! I would love to read AN APPETITE FOR MURDER thank you. It never got above zero here today--so please transport me to your location for the rest of the winter. I'd love to have some warmth for Christmas. I would love to read Topped Chef. I've never been to Key West before. Would love to read this book right now! It was only 16 degrees here today, I 'm sure reading this would warm me up FAST!!! Most of the comments seem to come from folks like me who live where it is currently COLD (and snowing here as well) - Key West sounds wonderful, especially with a dog as neat as Evinrude. I'd love to read any of your books, but Death in four Courses would be my first choice. Happy Holidays. Enjoyed your blog today...great photos.Love the dog picture. It has turned rather cold here. I have not read anything from this series. I would love any! I'd love to win any of the series to give to my best friend for Christmas! She loves foodie mysteries!! I would love to win one of your books. Any of them would be so great to have. This is a new to me series so I'd love An Appetite for Murder. I LOVE this series! It always makes me hungry for the food she describes though! I can't wait for the next book in February!! I loved An Appetite for Murder! I'd love to read Death in Four Courses next! Well I used to have a friend who lived on a house boat and they wanted a try they could look at while they said on their deck. With no room they built a floating box and planted one and tied it to the deck. it was cute and when Christmas was over they just took the tree out and turned the box over and used it as a table. Anyway I would love to win a copy of your book. I loved Christmas in Florida! I was an AM in the Ft. Lauderdale Borders which had the canal out our back door & the beach just a street away out the front so we got to see all kinds of boats dressed up for the holidays. I miss it so much...*sniff*...I love reading your books. They take me right back to the wonderful times I had living in Florida...minus the murders, of course! LOL!